As always, Loaded Tater Tots (four cheese alfredo, smoked gouda, candied jalapeños, bacon). 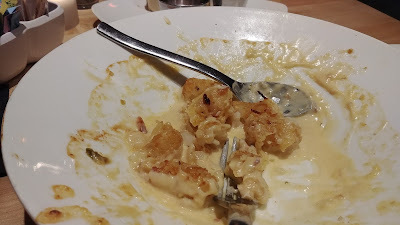 As you can see, we like these so much that I forgot to take a photo until they were nearly gone. Cheesy deliciousness. 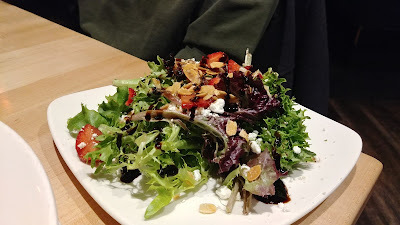 We shared Strawberry Salad (field greens, balsamic marinated strawberries, goat cheese, candied almonds, balsamic reduction). It's good, though I find the balsamic a tad strong/sweet. 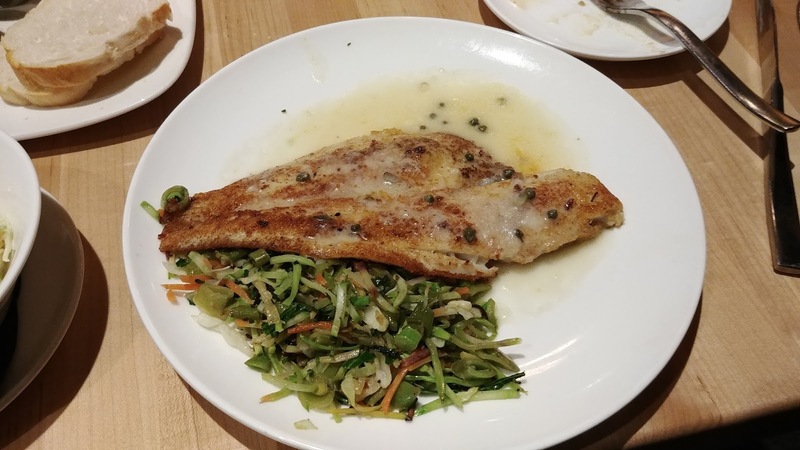 SP's entree: Caper Flounder (light lemon caper cream sauce) with the vegetable mix of the day. He likes lemon and capers a lot, so this was a great choice for him. 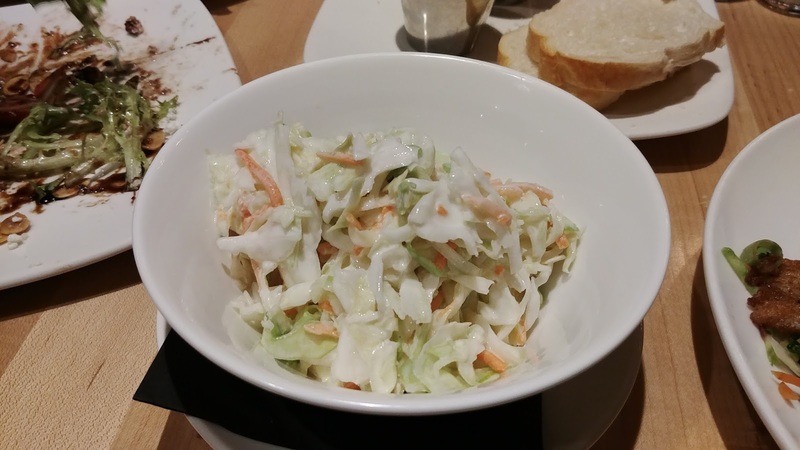 His other side: cole slaw, which I helped eat. 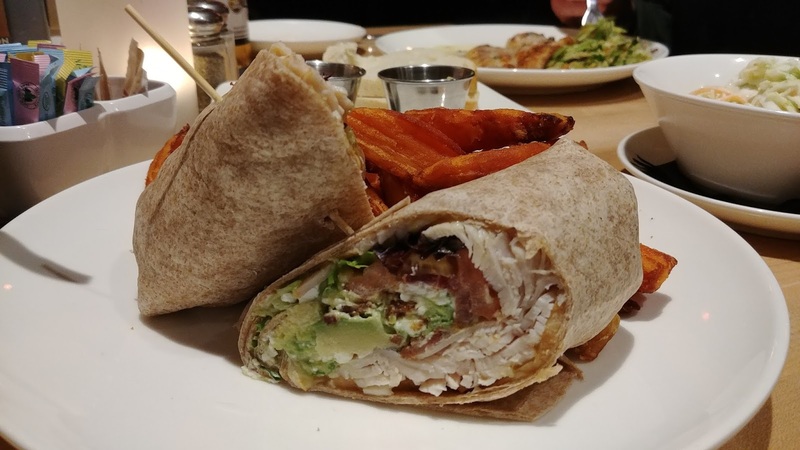 I chose California Turkey Wrap (roasted turkey, candied bacon, greens, tomato, avocado, honeycup mustard, goat cheese, wheat wrap). 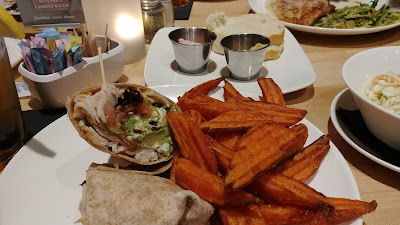 This was very good although I don't like wheat wraps. I figured I'd give it a try but I don't think I'll try wheat wraps again. I mentioned to SP that wheat wraps tasted kind of bland and cardboard like. He agreed - but he's the one who always wants wheat wraps and scolds me for my white wraps! And he finds them bland, too! I chose sweet potato fries for my side. I didn't eat them since I was full from tater tots, salad, and half a wrap. We ate them for lunch the next day. Happily, there is again fresh brewed iced tea. The last time we were there, it was fountain tea - boo. We like Walnut Grill and are glad it's an option so close to us in Robinson. I'm sure we'll be back.